In final of the European Invention Salon Concours Lépine, 3th-13th of September, Strasbourg, France, AMA Co.Ltd was awarded with the golden medal for actual development of Helicobacter pylori diagnostic tools. 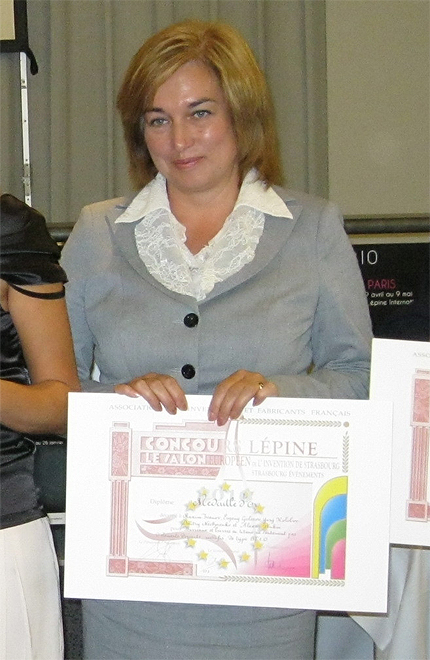 The Concours Lépine, organized by Association of Inventors and Manufacturers of France (A.I.F.F.) under the French Government patronage is the most popular European exhibition of inventions and innovations, therefore its awards are most prestigious. The main amongst prizes are Grand Prix of the President of France and Grand Prix of Association of Inventors and Manufacturers of France (A.I.F.F.). Also the international independant jury examines inventions and adjudes to winners golden, silver, bronze medals and medals from A.I.F.F. Participating in the Concours Lépine is a good possibility for inventors to demonstrate their achivments and to win the recognition, and also to approach to commercialization of their inventions.